The first quarter ended on a disappointing note for the Wolves, with Patty Mills making a goal and one to pull the Spurs in less than three. Gorgui Dieng and Robert Covington signed up for the start of the second quarter, which meant the Wolves were getting ready with Tyus Jones, Derrick Rose, Covington, Dario Saric and Dieng. In the first possession of the second quarter, Dieng blocked a shot from Mills, then made a jumper on the other end. It was a sign of things to come. By the time the dust cleared and Andrew Wiggins entered the match six minutes later, the Wolves' second unit had gone on a 19-4 score and the score was 47-29. That would only improve from there, as the wolves went from front to back to an incredible dismantling of the Spurs in 128-89. The victory allowed the Wolves to return to .500 11-11 and it was undoubtedly their best performance of the year, led by a group of players suddenly exciting and effective. 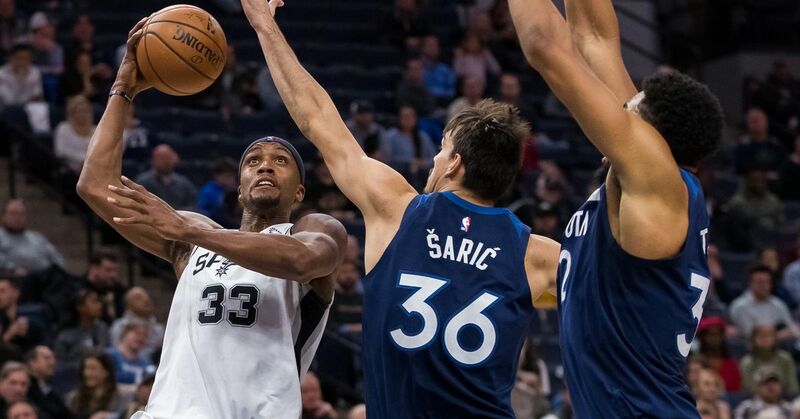 It was an absolutely spectacular defensive performance of the Wolves, who kept the Spurs 58 points in three quarters, and nine unfathomable points in the second quarter, thanks in large part to the efforts of this second unit, led by Robert Covington. As we discussed at length, RoCo completely changed the Wolves' defensive attitude, and tonight it was shockingly apparent. Their effort and commitment to defensive possessions is something we have not seen since … I do not know, the early days of the KG? As usual, Covington created defensive havoc all over the world. He was the best scorer for the Wolves with 21, and an incredible +44 in 31 minutes. It's hard to overestimate the difference he made with this team. Their help to recover was always efficient and on the point, they were looking for detours and robberies (they ended up with 12 flights at night), their paint protection was aggressive all night, their big ones showed up and picked up on pick and roll (is a new ride for them – the cities have had some interesting examples) and their closures have been deliberate. It was a brilliant defensive performance for which everyone deserves congratulations. In the end, they managed to contain less than 40% of the Spurs and to force 18 turnovers. They did not allow anyone to go and showed a remarkable refusal to give up everything. In truth, the wolves dominated in the painting in this one, with 58 points in the painting and 22 points of luck on 2. They effectively moved the ball, with 33 assists on 50 made baskets, made an extra pass and generally seemed faster and more active than the Spurs, who were playing the last game of a long road trip. Karl-Anthony Towns had one of the best defensive performances I've seen of him. Protected the rim, helped and recovered, successfully covered over several NRPs – that was all we wanted, with 16 points, 11 panels and 5 aids. Fantastic. Derrick Rose continues to make shots: 6-8 in total, 4-5 out of three. 16 points on the match. As I mentioned the other day, Wolves are collecting flights at an unprecedented rate recently – another 12 tonight. This is a major factor in their success. I know it was waste time, but Josh Okogie reminded us why he should play. 10 minutes, 12 points on 4-7, 2 tables, 2 assists, one steal, one shot, and, yeah, three fouls. He looks like a young RoCo. The Spurs were unprepared for the second quarter attack and, once that happened, he showed no fighting to try to get back into the game. They were out of gas. Terrific starts at home for the wolves. .500 baby!